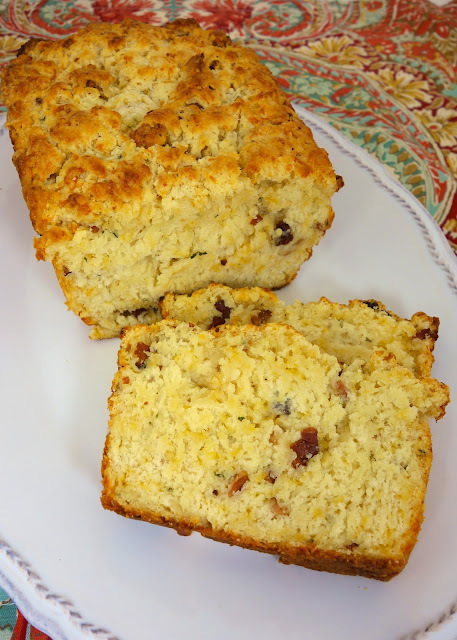 Cracked Out Beer Bread recipe - quick homemade beer bread that is loaded with cheddar, bacon and ranch. Ready to eat in under an hour!! Great with soups and stews! If you follow my blog, you know I love to "crack out" everything! 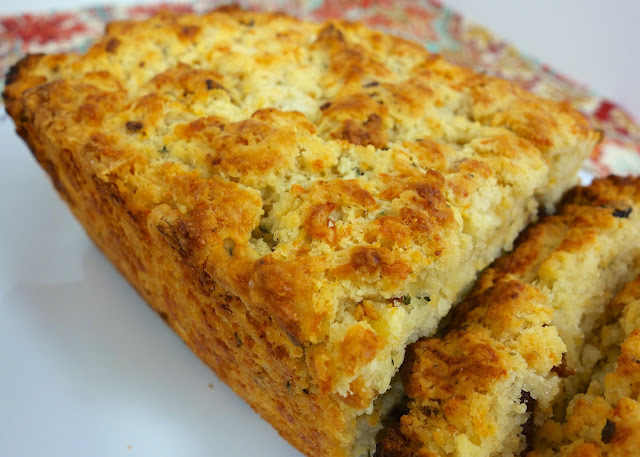 This time I decided to "crack out" beer bread. This is so simple and super delicious. You probably have all the ingredients in your pantry right now. The key to this bread is sifting the flour. It really does make a difference. Sifting the flour helps keep the bread light and airy. I used a Michelob Ultra for the beer since that was what was in the fridge. Feel free to use any beer you like. I couldn't taste the beer once the bread was cooked. We both loved this. This bread is crunchy on the outside and soft on the inside. It tastes great slathered with some butter. Give it a try tonight! Combine flour, baking powder, salt, beer, cheese, Ranch mix, bacon and 1/4 cup melted butter. Pour into lightly greased loaf pan. Pour remaining melted butter over bread. The bread looks outstanding Steph. Would you tell me what size loaf pan to use? I have 6 bottles of beer that are too stout for my hubs taste, and this would be a good way to use them up. I want to buy aluminum loaf pans to give away. Also, do you think I could cheat by using Oscar Meyer cooked bacon crumbles in the sack, instead of frying my own? Thank you !! Looks great! I certainly do have all of these ingredients on hand and may make this tonight. You certainly know how to speak to my husband's heart with your recipes. Thanks for sharing. Dacry - I buy that too! So much easier (and cheaper) than packets! Cece - I just use a standard loaf pan. It is 9x5. Enjoy! does the beer act as yeast? what would happen if i used yeast/sugar in this recipe?? Looks great! Do you sift the flour before or after measuring it? I assume after, but I want to make sure. Carrie - sift the flour after you measure it. Enjoy! Anita - I used all-purpose flour. If you use self-rising omit the baking powder and salt. OMG This was amazing! I just finished my first slice and I'm going back for more! YUM!